Boca Raton, FL — Calling all foodies and oenophiles! Bundled event tickets are now on sale–at reduced prices for the month of December 2018–for the 17th annual Boca Bacchanal, which will be held on April 4 – 6, 2019, at the famed Boca Raton Resort & Club. This popular and much-loved food and wine festival–which regularly draws over 2000 residents and visitors, each year, from throughout South Florida–is hosted by the Boca Raton Historical Society & Museum. 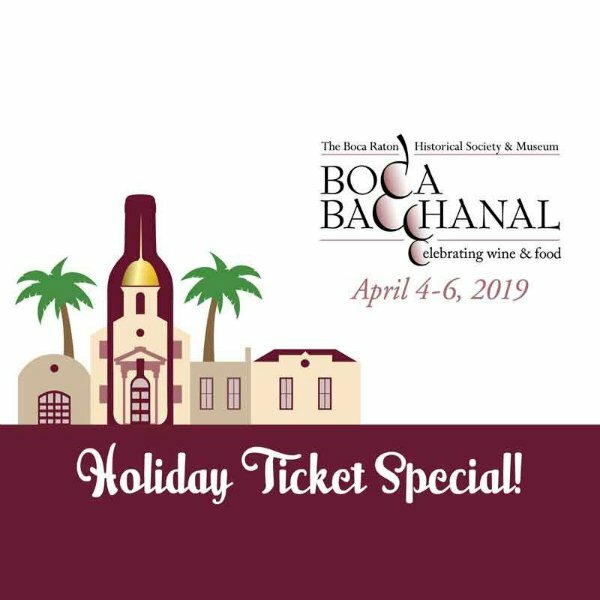 Best of all, Boca Bacchanal will bring together world class chefs from all over the United States, and distinguished vintners from all over the world, who will offer attendees the opportunity to enjoy scrumptious food and refreshing libations, while supporting an extremely worthy cause. Boca Bacchanal 2019 will open on Thursday evening, April 4, 2019, with an enticing new event– Bubbles & Burgers–at the Boca Resort’s Beach Club. On Friday evening, April 5, 2019, guests can enjoy themselves at one of the signature Vintner Dinners, which will be held in elegant homes and at historic locations. Vintner Dinner guests will enjoy delectable five-course dinners, in intimate dinner party settings, where extraordinarily talented chefs and vintners will work in tandem to create truly memorable dining experiences. Another new event, the VIP Party–showcasing the featured vintners–will take place dockside, at the Boca Resort, on Saturday evening, April 6, 2019. Guests, who opt to attend this event, will also have the opportuity to tour a luxurious 90-foot Cheoy Lee yacht, before they head over to the Grand Tasting. The festive finale, to the upcoming Boca Bacchanal–the Grand Tasting–will also be held on Saturday evening in the Boca Resort’s Great Hall. Guests will have the opportunity to feast on small plates–which will comprise a unique dinner-by-the-bite–from over 20 superb restaurants, and to sample over 130 wines from an array of impressive wineries. Guests will also have the opportunity to participate in live and silent auctions, for items ranging from vacations and dinners, to jewelry, handbags, and clothing, to artwork and electronics. Bundled tickets, at reduced prices, to the VIP Party and the Grand Tasting, on April 6, 2019, may be purchased for $175, per person. This represents a $25 saving, per person. From January 1 – April 6, 2019, people may also purchase tickets to any of the individual events at regular prices. Tickets, to Bubbles & Burgers, on Thursday evening, April 4, 2019, are $75, per person; tickets to the Vintner Dinners, on Friday evening, April 5, 2019, are $350, per person; tickets to the VIP Party, on Saturday, April 6, 2019, are $75, per person; and tickets, to the Grand Tasting–also on Saturday evening, April 6, 2019–are $125, per person. It is important to note that tickets, to the VIP Party, are only available to guests who also purchase tickets to the Grand Tasting, whether guests purchase them in December 2018–at the discounted bundled rates–or at the regular prices. Since its inception, in 2003, the Boca Bacchanal has supported the Boca Raton Historical Society & Museum. 100 percent of the proceeds, from this wonderful weekend food and wine festival, will fund innovative and diverse heritage education programs for residents, students, and visitors. These programs are now serving upwards of 1200 school children, each year, with impactful experiences in historic locations.